Advanced Micro Devices (NASDAQ:AMD) is in a particularly tough spot. Not only is the stock caught up in a wave of selling like the rest of the S&P 500 and Nasdaq, but a decline in crypto-fueled chip demand is pouring extra pain on the stock. While the Nasdaq is down about 18% on the quarter, AMD stock is down more than 40%. We’ve covered a few winning stocks for this quarter, as they’re important to distinguish during times like these. So, even though Starbucks (NASDAQ:SBUX) has been under pressure, shares are still up 15% for the quarter. But imagine being in SBUX over AMD — the performance difference has been huge! Should that keep investors out of AMD or have them excited about a buying opportunity? The selling has been absolutely relentless. Think of the market like a spring. The further it stretches in one direction, the more fierce the snapback will be. Given that we’re down between 15% and 20% on most of the major indices this quarter, it’s pretty clear to even casual observers that we’re in a different environment. As a result, I wouldn’t be licking my chops for just any opportunity. When the tide shifts and we do get that rebound rally (which could be happening now), we’ll get a lot of momentum out of names like Advanced Micro Devices. I’m just not looking for a sustained uptrend to new highs in the near term. AMD stock and Nvidia (NASDAQ:NVDA) have been under intense pressure this quarter, both being hammered from their highs. While Intel (NASDAQ:INTC) has held up much better, it’s starting to show signs of weakness. Could it join its peers in a wider breakdown? We highlighted the name as one of five stocks that could break the bull trend. That doesn’t mean we should ignore this group. Instead, we should ask: how do the internals look for AMD? Net income and free cash flow continue to trend from the lower left to the upper right. Gross margins, operating margins and profit margins continue to creep higher, while long-term debt continues to decline. All the while, AMD’s valuation continues to improve. This doesn’t matter to the market, though. Admittedly, I don’t necessarily agree that AMD stock deserved to go from $9 in April to $34 in September. That said, now down near $16 to $17, share prices are starting to look more attractive to long-term investors. So where would we want to look? How about around $15. We’ll look at the “why” portion of the stock charts in a minute, but, from a fundamental perspective, AMD stock will be more attractive too. At $15, the stock will trade at 32 times current earnings. However, unlike INTC and NVDA, analysts expect stronger growth from Advanced Micro Devices in 2019. Analysts are calling for 170% earnings growth this year and another 35% growth in 2019, to 62 cents a share. Revenue estimates call for 22% growth this year and another 6.5% growth in 2019. Based on 2019 — if the estimates are accurate — AMD stock trades at a reasonable 24 times estimates. 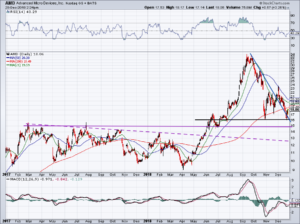 AMD stock formed a double bottom when it bounced strongly off $16 this week. Now up over $18, traders will want to see how it reacts to the 200-day moving average. Can AMD catapult over it and have the 200-day act as support, or it will it stymie AMD’s move just as its other moving averages have acted as roadblocks? The market selloff has been intense, but it’s been very orderly. So, we may or may not see the $15 level for AMD. If we do get there, bulls will have a decent risk/reward based on prior support and resistance levels. If $15 doesn’t hold (purple line), then investors can expect even more downside. 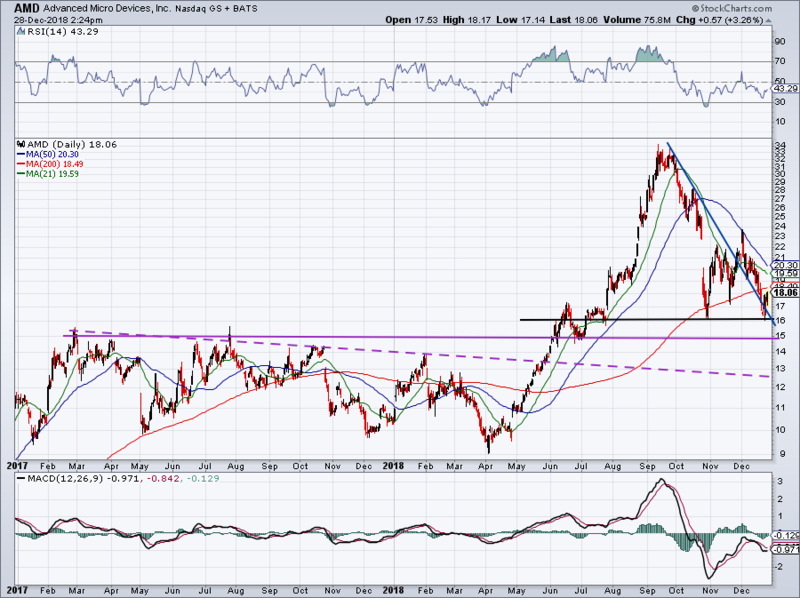 A drop down to the $12.50 to $13 level (dashed purple line) could be in the cards. This would be a great opportunity for long-term investors. While AMD stock is back over downtrend resistance (blue line), it has a lot of resistance overhead just as many other stocks do. For now, I want to see how these levels act and whether we’ll get a chance at AMD at an excellent price. Bret Kenwell is the manager and author of Future Blue Chips and is on Twitter @BretKenwell. As of this writing, Bret Kenwell is long NVDA and SBUX. Article printed from InvestorPlace Media, https://investorplace.com/2018/12/perfect-spot-buy-amd-stock/.